A New Zealand gliding speed record holder from Mount Maunganui has received international recognition for his contribution to gliding. Edouard Devenoges happened to be already heading to Europe before being told he was to receive the Paul Tissandier Diploma. He decided to alter his itinerary to be able to be in Rotterdam for the presentation. "I didn't know it existed, so it was quite a big surprise," he says, "and it was a good decision to make the extra arrangements to go to Rotterdam." He says he was very proud, especially as he was thought to have travelled the furthest to get there. "To be able to be there and walk forward onto the stage with people clapping was quite a proud moment." The diploma was this year presented to eight people from different flying disciplines across the world and is one of a number of awards presented by the World Air Sports Federation (FAI). It is presented to those who have served the cause of aviation in general and sporting aviation in particular by their work, initiative, devotion or in other ways. Edouard has been involved in gliding for 40 years and for the past eight has been the awards officer for Gliding New Zealand. This role was particularly highlighted in the citation, as it involves processing hundreds of FAI badge and record claims. "It is (here) where Edouard's diligence and assistance to claimants has been highly alued," reads the citation. 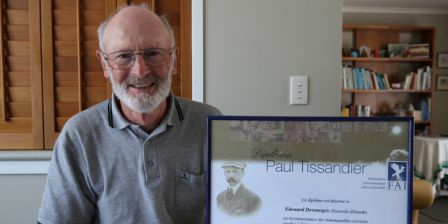 He was also recognised for his active involvement in assisting with and taking part in competitions, instructing and being a member of Gliding New Zealand's Sailplane Racing Committee. Edouard says the ceremony was an opportunity to meet famous people in world aviation. In 2009, he set the New Zealand speed record over 100km in the "World Class" division, with the distance covered at a speed of 94.23km/h. He is an instructor with Tauranga Gilding Club and keeps his own glider at Matamata airfield. He says the challenge of gliding is what spurs him on. "Once you get the aero tow, then it's up to you how long the flight is and to find the right conditions to remain airborne."